Friends are a commodity far valuable than material wealth; the best companions are there for you in your happiest and saddest moments, and even when there’s nothing to be said between each other while you watch your favorite show for the twentieth time, you still enjoy having their company. Our luxury apartments at Alexan North Station understand friendships quite well, which is why all our homes feature amazing amenities for both you and your guests, making your crash pad into the ultimate hangout. 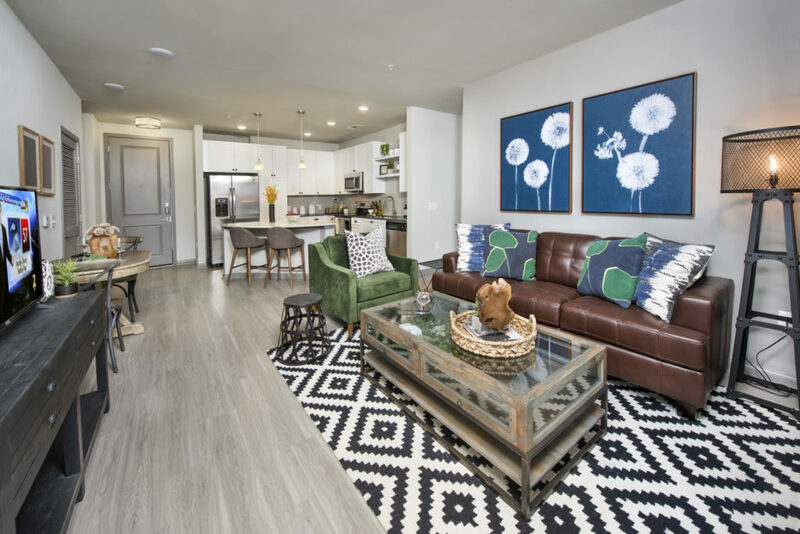 Our luxury apartments are beautifully designed before you even move in your first box of décor, thanks to the tall nine foot ceilings, lovely and durable wood-style plank flooring installed throughout the kitchen and living room, and two curated finish palettes that you can choose from. Serve up a big family meal or treat your friends to some tasty snacks in our contemporary style kitchens, featuring modern stainless-steel GE appliances, 42” custom cabinets and 24” kitchen pantries to stock all your groceries and cookware, energy efficient LED lighting, smooth gray or white quartz countertops with subway tile backsplash, and add-ons such as wine refrigerators for celebratory spirits and chef’s islands. Keep connected to long-distance buddies on your smartphone or tablet and charge them up using the USB ports set up throughout each apartment. Finally, take your fun conversations outside and bask in the lovely views of Sandy Springs right from the private patio or balcony space included in several of our luxury homes. Celebrate friendships right from the comfort of home at Alexan North Station. Venture through our luxury apartments in Sandy Springs and see our great amenities today.